The futures markets are largely quiet, as the northern hemisphere is largely complete for 2017 and seeding progresses for next year. At a local level, it is important to start considering local premiums and how to take advantage of them. This time of year is always bereft of data to move markets, in this crop calendar (link), it is clear that the year is largely finished for the global wheat crop. The only majors remaining alongside Australia to harvest are Brazil and Argentina. The lack of strong data, has left the market largely directionless. 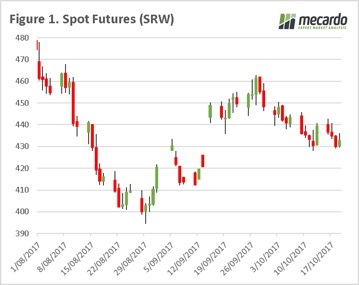 In figure 1, we can see that spot futures have trended downwards since December became the spot contract. Last night was the first this week to end the day in the green, albeit marginally. In good news, US export sales were up considerably week on week, which will help futures prices if maintained. At a local level, harvest has begun in the north and it won’t be long until the bulk of farms around the country will be ‘reaping what they have sown’. 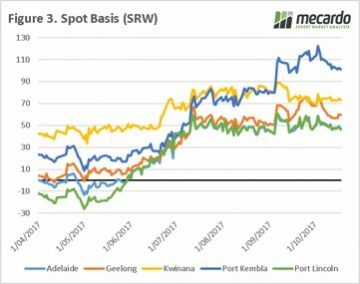 During October, rainfall has been strong through much of northern NSW and QLD, although not adding much in the way of benefits to the winter crop has added confidence in the summer crop. This has resulted in consumers reducing some of their buying appetite, as they reassess the situation for the coming 6 months. In recent weeks, prices around Australia have started to depreciate. In figure 2, the APW port price is shown for all zones. 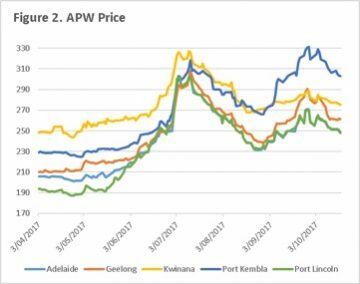 Over the past ten days prices have fallen 4% on the east coast and 2% in Kwinana. Basis levels have fallen in recent weeks, however remain at strong levels. The lack of grower selling, in combination with the fact that production & carryout will exceed requirements, increases the likelihood of falling prices/basis. At these very high basis levels, and low futures prices it is worthwhile examining a long swap/reverse swap strategy which has been outlined in ‘Lock in premiums, keep exposure to the market’. At present there are considerable premiums available for growers. As growers start to sell the crop, the logic would be for basis to fall. In order to avoid this, it is worthwhile examining your potential production with a view to commencing your sales program (if not already). This can be carried out through flat price sales or in conjunction with a reverse swap.